Figure 1: Najib is accompanied by Awang Tengah and Musa witnessed the exchange of MoU between UNIMAS and Resonics Consultancy. Nov 22, 2017, KUCHING: In conjunction with the 13th World Islamic Economic Forum (WIEF), Universiti Malaysia Sarawak (UNIMAS) and RESONICS Consultancy have signed a Memorandum of Understanding for cooperation in developing Smart City and Industry 4.0 on 21st November 2017. The Memorandum of Understanding between UNIMAS and RESONICS Consultancy were witnessed by Dato’ Sri Mohd Najib Tun Haji Abdul Razak, Prime Minister of Malaysia together with Datuk Amar Haji Awang Tengah bin Ali Hassan, Deputy Chief Minister of Sarawak, Dato’ Seri Idris Jusoh, Minister of Higher Education and Tun Musa Hitam, Chairman of the WIEF Foundation at 2.00 pm at the Borneo Convention Center Kuching (BCCK), Sarawak. The collaborative initiative for Smart City and Industry 4.0 is a continuous effort between industry and university in Sarawak in line with the government’s aspiration for the digital economy transformation in order to accelerate the development plans primarily through using technology applications as well as strengthening broadband network services in Sarawak. 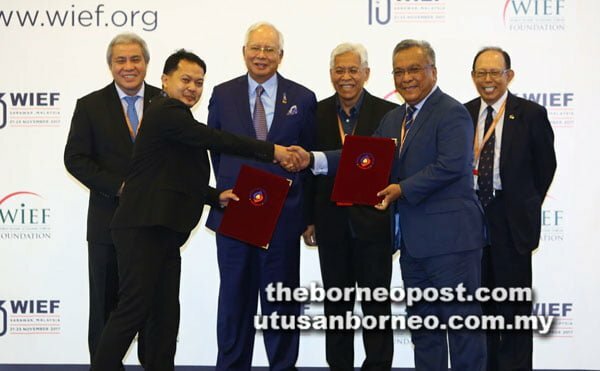 “UNIMAS will continue to strive to increase the involvement of industry, society and especially the people of Sarawak for research and development in Smart City and Industry 4.0 primarily through ICT facilities and infrastructure that will be developed in Sarawak,” said Prof. Datuk Dr. Mohamad Kadim Suaidi, Vice-Chancellor of Universiti Malaysia Sarawak. “We have identified several clusters in the digital economy transformation initiatives for university-industry collaborations primarily for Smart City and Industry 4.0, including research and development in Smart Agriculture, Smart Manufacturing and Smart Community specifically for Sarawak,” added Prof. Datuk Dr. Mohamad Kadim Suaidi again. RESONICS Consultancy has also signed 2 more memorandums of understanding with FinTech4Good LLC and Umadx Online (Malaysia) Sdn Bhd. The aim for RESONICS Consultancy is to position Sarawak especially Kuching as a hub for technology development and entrepreneurship in the country.